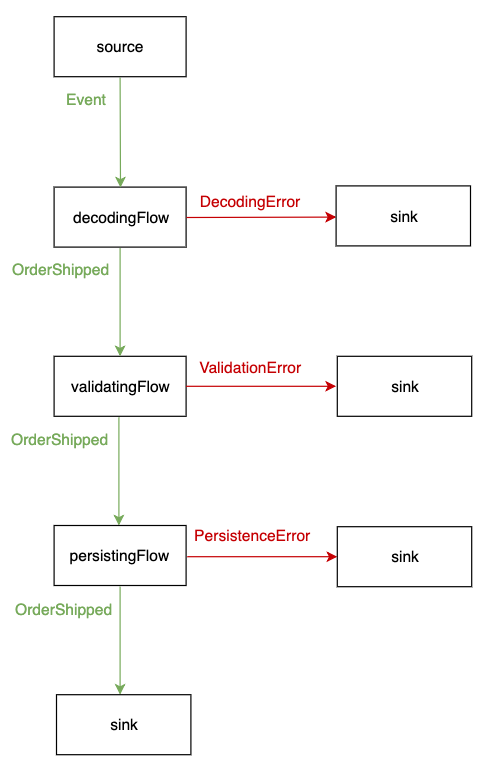 A short read about being careful with error handling in stream design. Akka Streams seems to be a reasonable choice when it comes to event processing. A wide variety of connectors and integrations make it easy to assemble a working pipeline and get up to speed quickly. On the other hand, we have a long list of predefined operators, GraphDSL, support for error handling, a possibility of rolling out custom stages and many more. It means, that having a rough idea of what do we want to achieve, there is always a number of ways to approach the stream design. It’s quite easy to assemble a working graph. But to make the code scalable, maintainable and easily extendable by other developers, it usually needs experimentation and playing around with different approaches. Especially when building a non-trivial processing pipeline. One hint, that might help to narrow down the choices is starting with types. If you’re not sure, how to design this Flow or that Sink, think about what could be a reasonable type. In other words, think, how to express the role of this stage in types. This usually helps when facing multiple choices, and can guide you to the final design. One of the most fundamental things when designing a stream is error handling. And of course — with Akka Streams — there are multiple ways to do it. Now, having all of this in mind, let’s see how to iteratively tackle this problem in a real-world example. Consuming an event (from e.g. SQS, Kafka, …). Applying validation to exclude events, that do not fulfill some conditions. As you might notice, each stage might fail. And this is where error handling is important to get right. Otherwise, it might have a negative impact on the overall stream design, what you’ll see next. val source: Source[Event, NotUsed] = ??? In the next step, we’d probably want to decode each event to give it a domain meaning. Let’s use circe for it. Either[Error, OrderShipped], NotUsed] = ??? In order to make this stage composable, it has to accept Either[Error, OrderShipped] on its input. Let’s pause here and think. Why would it accept Either on its input? What would it actually mean? Handles theRight case, and executes the business logic. Handles theLeft case, and immediately passes it forward to the output. And it’s bad if all our stages, by a wrong design decision, do two things, instead of one. DecodingError can e.g. include the raw Event, push it to a Dead Letter Queue, and commit the cursor. ValidationError can e.g. commit the cursor immediately, as we might not care about invalid events. PersistanceError can e.g. also include the raw Event, push it to a Dead Letter Queue, and commit the cursor. 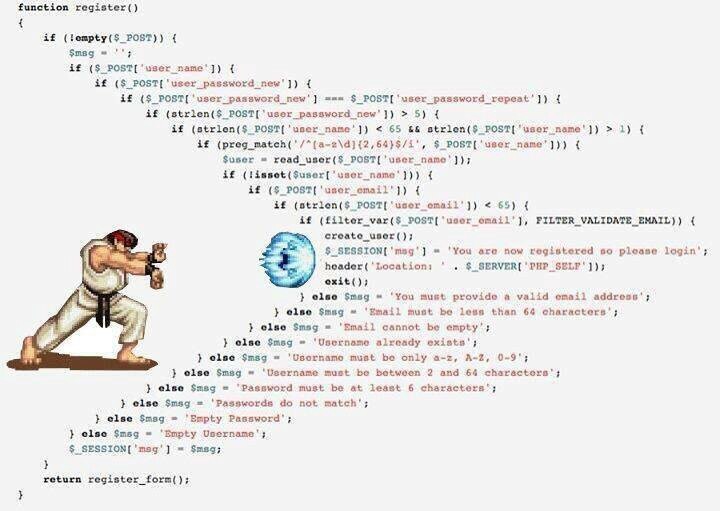 Or it can use a completely different error handling strategy. Let’s now think about how to improve on the graph wiring itself. Now we have almost all pieces in place, but ???. It turns out, that such stage can be easily created with Partition graph operator. Fortunately, it also turns out, that such stage is generic enough to be already defined in Akka Streams. And it’s called divertTo. It’s also important to emphasize, that each errorHandlingSink can be of course different, and hence apply a different error handling strategy. Congratulations if you survived up to this point! Akka Streams gives a solid foundation for building data-intensive pipelines. It comes with a wide variety of building blocks, but sometimes because of this reason, it can be easy to shoot yourself in the foot. When designing a stream, there’s no single best way to do it. You usually explore different possibilities, try, and fail. As we went through the problem of error handling, we did 3 iterations, but ultimately landed with an acceptable design. Try not to start with Graph DSL. Start by looking at the list of operators. It’s being updated frequently from release to release. Start with types. It really helps. Try different approaches and experiment. There are always multiple ways of designing a non-trivial stream.